Anonymous sale, Christie's, London, 17 June 2004, lot 41. A. Slott-Møller, Folkevise Billeder, Aschehourg & Co., Copenhagen, 1923, p. 100. Copenhagen, Charlottenborg, Spring Exhibition, 1906. London, Art Gallery of the Corporation of London, Danish Art Exhibition, 1907. Agnes Slott-Møller trained at the Tegneskolen for Kvinder (Design School for Women) 1878-85, and later with the renowned Danish artist Peder Severin Krøyer from 1885 to 1886. Following her marriage to fellow artist Harald Slott-Møller, she travelled to Italy where she came under the influence of early Renaissance art. It was her frequent trips to England, however, that had the most profound effect on her art. We see in the way in which she depicts figures in her paintings of scenes from fairytales, folk songs and legends the influence of such artist as Dante Gabriel Rossetti and Sir Edward Coley Burne-Jones. While in England, she also met with artists associated with the Arts and Crafts Movemement and with the English journal, The Studio. Her scenes of Danish medieval history and poetic ballads reflect this interest in the late nineteenth century English cult of the aesthetic. Like those artists involved with the Arts and Crafts Movement, Slott-Møller took great care in devoting time to uniting her images with their frames, which are often ornamented with fine details and elaborate carvings. On a visit to Venice in 1904 Slott-Møller saw the narrative paintings of Vittore Carpaccio (1450-1525) depicting the legend of St Ursula. The influence of Carpaccio's work can be seen in Slott-Møller's The Dying Betrothed. She was especially moved by Carpaccio's The Matyrdom and Funeral of St Ursula which depicts both the violent martyrdom of the pilgrims and the contrasting sad and mournful scene of Ursula's funeral. Slott-Møller was so inspired by this piece that she later described it in her book, Folkevise Billeder, in 1923. 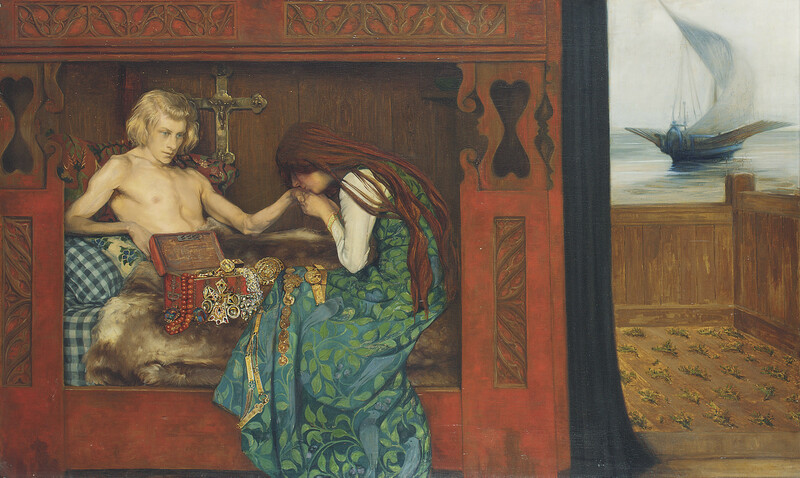 The Dying Betrothed depicts a scene from a Danish folk song Liden Kirsten. It portrays the moment when Liden Kirsten finds her Betrothed dying. Overcome with grief, she kisses the hand of her love tenderly as he pushes his treasures towards her, forsaking his mother's wish that he think first of his brothers and sisters. Like Carpaccio's funeral image, the picture is cleverly divided into two. On the right we see what looks like a balcony strewn with small branches of fir, as is the custom in Danish funerals. Beyond the balcony is a ship sailing into the distance, its sail becoming ghostly as it merges with the colour of the sky. This is most probably the ship of death waiting to take her betrothed away. What Slott-Møller has achieved which perhaps Carpaccio has not, is the real poignancy of the image. The way in which she has compressed the image, for example, so that the sadness of the figure seen on the left is heightened in this limited space. The solid divide between the girl with her betrothed and the ship also emphasises the gulf between this world and the next. Charlottenborg Spring exhibition in the same year. Agnes Slott-Møller was subsequently awarded the Eckersberg medallion by the Royal Academy. This was a well-deserved award for a hauntingly beautiful image.